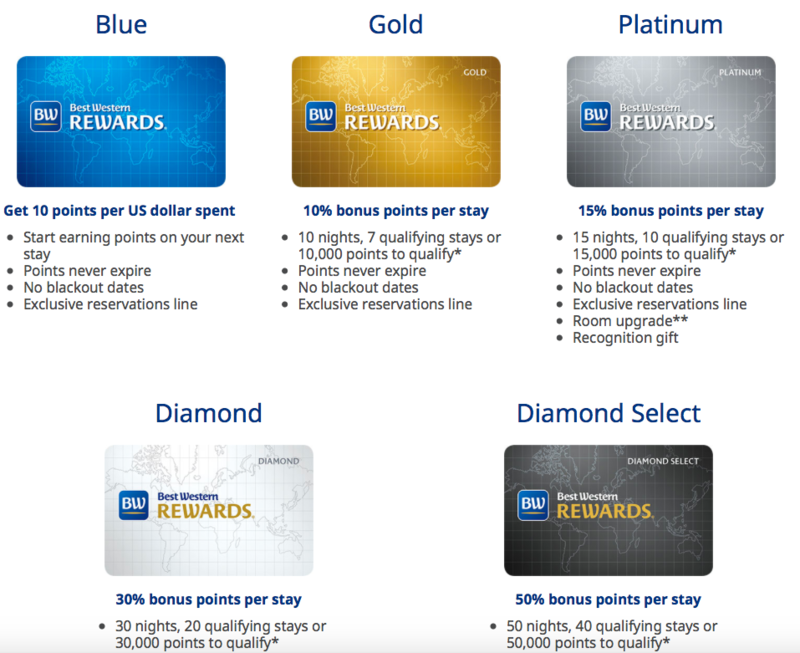 Best Western Rewards Permanent Status Match Program – Match Any Hotel Status Up To BW Diamond! Best Western Rewards offers a permanent Status Match Program that invites interested members to match Elite Status from any other hotel rewards program to Best Western. Best Western offers a vast variety of status levels (Five Total) and the website isn’t exactly very informative in regards to in depth details of the individual levels. You can access the Best Western Rewards Status Match website here. The information regarding the levels which will be matched are also missing but overall it can be expected that Best Western would try to match each application to a comparable level in the program. With our Status Match…No Catch program, we will match your ELITE status in any other hotel loyalty program, FREE of charge. Begin earning Status Match…No Catch points at the Elite level instantly—and watch them add up even faster. To match your ELITE status in any other hotel program, download the Status Match…No Catch form, which provides proof of elite status with another hotel program, and we’ll take care of the rest. There have been instances with other Hotel Loyalty Matches where status levels were matched but not to the absolute top tier level and it’s clear based on the description and T&C of this program that Best Western will follow exactly that example and not match the to top tier Diamond Select. What is important to me when it comes to hotel loyalty programs are on property benefits. In regards to Best Western Rewards you can see that the levels Platinum, Diamond & Diamond Select come with Room Upgrade & Recognition Gift. As per the Terms & Conditions of Best Western Rewards (see here). … Members who achieve Elite Status at the Platinum, Diamond, and Diamond Select levels receive a welcome gift upon check-in. There is no benefit in terms of complimentary breakfast and most importantly there isn’t any clear definition of what type of upgrade will be extended to the member. It can be literally anything (or nothing) with no checks and balances in place. The program is also pretty weak as there are no published benefits of late checkout and coplimentary breakfast. This seems to be a generous program for a status match and I just applied myself as a test case to update our readers on the progress in due time. I have done a bit of reading on FlyerTalk and other discussion boards to see how Best Western treats their Diamonds and it didn’t sound very promising. Given the high annual requirements to qualify for these levels the official way it doesn’t seem feasible to me why anyone would actually stay 50 nights (40 stays) at a Best Western to obtain a status with no hard benefits.